Our recent trip through Pennsylvania opened our eyes to many new things. First, New Jersey and Pennsylvania are much prettier than we thought. Second, Pittsburgh is not the “dirty steel town” I expected it to be. And finally, no matter where you go, farmer’s markets are still the best place to buy your food. The most prized stop at the Pittsburgh farmer’s market was Olio Fresca which sold all sorts of flavor-infused pasta that we could sample (uncooked). The flavors in the pasta were surprisingly strong, and the guy told us that the flavor doesn’t go away when you cook it; We’ll see about that pasta-man. To my surprise and delight, he was correct. It made for one of the simplest and best homemade meals we’ve had in a while. And that’s cottage cheese I put on top, not ricotta – don’t give me that face, you won’t notice the difference. At least I didn’t add peanut butter. 1. Saute the squash in a large skillet with 1t olive oil. Cook until the squash is tender (about 5 minutes), then place aside. Now add the garlic to the skillet with 1t olive oil and saute for 30 seconds. Add the tomatoes, red pepper flakes, italian seasoning, salt, pepper and wine. Cook for about 2-3 minutes, or until tomatoes are tender. 2. Add the squash back into the skillet along with the chives and chickpeas, if using. Simmer for 4-5 minutes to let the flavors combine. 3. Spoon the sauce over the cooked pasta, top with dollops of cottage cheese and grated pecorino romano. Yup, the whipped cottage cheese has a totally different texture than regular cottage cheese. It’s not as watery/slimy and it is much closer to ricotta. I used to dislike chickpeas, but ever since I had them in Italy in a spicy pasta dish, I’m in love with them. Not sure how they could freak anyone out though…I guess they are a bit strange looking. Relative of the peanut though! I’m with Chuck – whipped cottage cheese is new to me. Guess it’s a bit like ricotta? 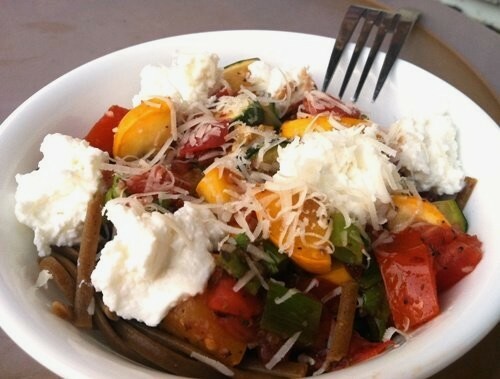 Love this recipe and its use of the summer squash! Yes sir. It’s a lot like ricotta and usually cheaper. Give it a shot! I would love to try that flavored pasta! Pittsburgh is highly underrated by the rest of the country. Olio Fresca is wonderful as are so many things about Pittsburgh’s food culture. This recipe looks yum and I’m all set to try it out tonight! Thank you!